One of the beautiful things about photographing wildlife is that you’re never fully in control. Sure, this is also why many people don’t have the patience for wildlife photography but this suits me down to the ground. Controlling, directing and creating the scene for the perfect image is not in my nature…which, incidentally, is one of the reasons I don’t photograph weddings. Of course it’s frustrating when you’re all set up, the light’s perfect and you’re waiting for a wild dog to saunter into an opening just for it to decide to change tack at the last minute and nip behind a bush. But that’s the hunt for the perfect shot that keeps wildlife photography interesting. We’ve all done it – muttered under our breath, willing our subject to ‘look up’, ‘turn around’ or ‘stop there’. Every once in a while, they even cooperate…. I filmed this clip on my Canon 5D MK2 while shooting stills with my 1D MK3. I was on a commission in northern Botswana and we came across this Leopard on Chief’s Island in the Okavango Delta while on a drive with our hosts Wilderness Safaris and Botswana Tourism. A while ago I blogged on the darting and translocation of Rory, a young African wild dog, from South Africa’s Venetia Limpopo Nature Reserve to his new home in KwaZulu-Natal. After some rather downbeat posts recently on the trade in wild dogs and on their endangered status, I thought I would give you an update on how Rory is doing as well as the video of his translocation that I shot earlier this year. As an outsider joining an established alpha pair, Rory couldn’t have fitted in to his new pack and surroundings any better. The alpha female gave birth to eight pups this year and Rory has been the main babysitter and provider of food after hunts, regurgitating meat for the mother and for her litter. His care and responsibility towards them has ensured that all eight pups have made it through their first six months alive and well. But it’s not all been hard work and responsibility…Charl Senekal, the reserve manager at Hlambanyathi Game Reserve where Rory was moved to, has noticed that the pack has taken to regularly chasing leopards up trees – a curious and dangerous game given the violent death of most of Rory’s family at the hands of predators. The video shows the lengthy darting and translocation process that took place earlier this year to move Rory to KwaZulu-Natal. Four of the five darts fired made contact but, as is the case with such darting procedures, things don’t always go to plan. Two of the darts were ineffective and it was the fifth and final dart that had the desired effect. It is never ideal to have to intervene to such an extent in the lives of wild animals but with so precious few African wild dogs left and with their plight on our watch, it is sometimes a sensible and necessary decision. And in this case, with Rory playing his part in the survival of eight young dogs at Hlambanyathi, there can be little doubt that decision has been justified. This is the first time on my blog that I have used another person’s photography but those of you who have visited this site before will know how strongly I feel about plans to mine coal near to the wonderfully unique Mapungubwe National Park and World Heritage Site. This female leopard was found on the main road outside Mapungubwe National Park by carnivore researcher Wendy Collinson. Wendy is currently monitoring wildlife casualties on the road network surrounding Mapungubwe National Park and the De Beers Venetia Limpopo Nature Reserve. The road network cuts through the proposed Greater Mapungubwe Transfrontier Conservation Area and serves border posts with both Botswana and Zimbabwe, and so an increase in disturbance by non tourism or conservation related traffic to and from the proposed Vele colliery would be hugely detrimental to the region’s sensitive wildlife. 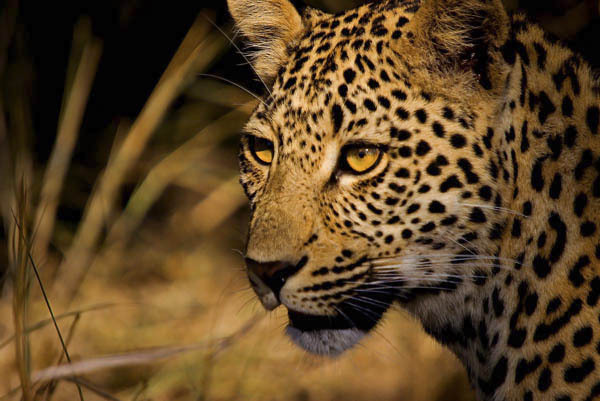 Wendy has yet to confirm whether the leopard hit on the R572 road is a beautiful female known to researchers as Leila. Leila was fitted with a GPS collar so that her movements could be monitored in an area where predator conflicts with farmers are common but the carcass found had no tracking collar. South Africa’s self-governing environmental guardians the Green Scorpions swooped on the colliery site recently, gathering evidence that mining company Coal of Africa Ltd had acted outside of the legal permissions granted earlier this year. It’s hoped that current investigations by the environmental department will provide a lifeline for this awe inspiring and culturally significant landscape. The wild dogs of Venetia Limpopo have had a turbulent last few years – mainly at the hands of lions – resulting in alpha female Stellar cautiously leading her small pack of five from rocky safe haven to rocky safe haven each day. 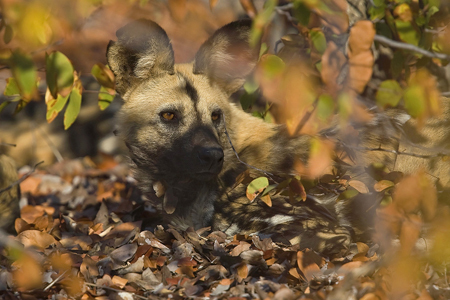 When Stellar became pregnant recently it was clear that her mind wasn’t just on survival for her pack but on growth and for a short while all seemed rosy in this colourful mopani and baobab clustered corner of South Africa. Though having lost her entire litter the previous year, the future of the pack hung desperately on her ability to find a safe den site. The bitter irony of choosing a rocky high-ground for the den in an attempt to avoid dangerous competitors like lion and hyena was that she lead her pack straight into a leopard’s domain, a choice which cost her mate Abel his life. The trauma of the attack split the pack leaving Stellar out on her own. Did she not flee with Fender, Rory and Baker because she had pups hidden away? It was too soon to tell as she would only bring them out of the den after a few weeks…but with one less member of the hunting pack, her chances of even keeping her pups alive that long would be slim. We know Stellar has met up with the others but still spends time on her own. 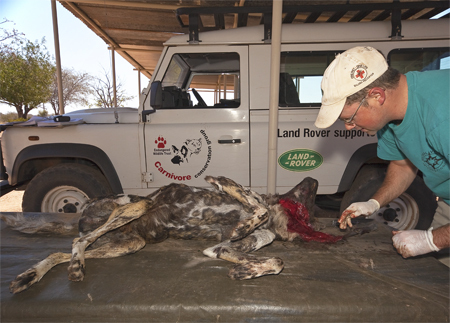 We also know a pack from Botswana and free roaming dogs have explored the boundaries of the Venetia territory. So is Stellar desperate for the support of the pack for the survival of her pups or will the others disperse and move on? 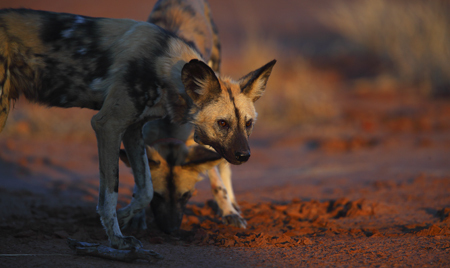 It’s an interesting and crucial period in the life of the Venetia pack and one that echoes the broader fight to save Africa’s wild dogs. In a natural and competitive environment where size matters, wild dogs have their own battles and with only a few hundred left in South Africa alone, losing an alpha dog is a real setback and an event that can change the fortunes of a pack and the balance of a population. As we inspected Abel’s carcass, the importance and fragility of EWT’s efforts became clear, the only consolation in the thought that at least Abel wasn’t another statistic born out of man’s misunderstanding and intolerance of these charismatic canids.